While this has been done before, the fact that the iPhone is from Apple draws even more attention. Yes sir, Steve Jobs and company have decided to prep up the iPhone with even better specifications than originally intended in order to please the iPhone camping crowd (camping out for a console or movie ticket are pretty normal things, but for a cellphone?!? That’s practically unheard of until now) when Apple’s sophomore cellphone effort is released this June 29th. What can you expect from the iPhone when it is finally released? For starters, an enhanced battery life that will surprise even the most hardened detractors. The iPhone will come with enough juice for 8 hours of talk time – long enough to yak through one third of a day. If you plan to use the iPhone for surfing, that won’t be a problem either, since it is able to let you surf the World Wide Web for up to six hours before gasping for some power. Standby time is rated at a whopping 250 hours – that is slightly more than 10 days without having to plug it inside. Of course, 250 hours is the most optimistic figure you can get, since how many of us get by 10 days without receiving a single phone call or text message, let alone ring up other friends? If our purchase the iPhone primarily for MP3 playback, it will last a full 24 hours, while video aficionados can watch the Titanic two times over on a single charge, with an extra hour of playback still available. The much improved battery isn’t the only goodie that new iPhone owners will receive, as the whole top surface, including the 3.5″ display, will ditch plastic in favor of optical-quality glass for an extra layer of protection against scratches (it won’t be scratch proof though) while providing superior optical clarity. Are you camping out for an iPhone? Will these improvements sway your decision assuming you have been sitting on the fence all this while? Just a reminder for those who want the iPhone – the 4GB model and 8GB model will retail for $499 and $599 respectively when it rolls out this June 29th. 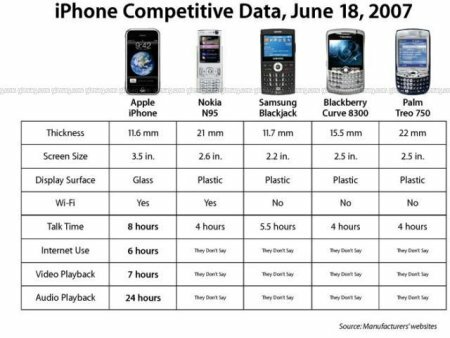 Sorry but the comparison didnt include camera (N95 5mp, iphone 2mp) or the 3G (N95 good 3G, iphone nil) Or the light (N95 mini flash, i phone, nil). Doesnt that make you think that the iphone is more last years tech? ?